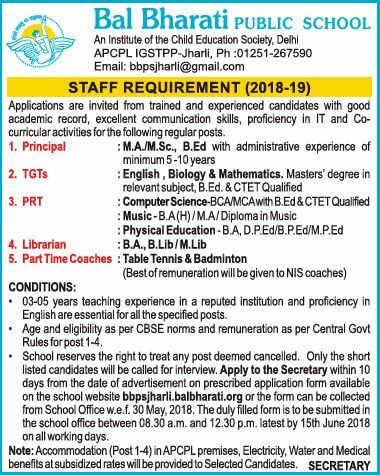 Bal Bharati Public School, Jharli has advertised in THE TIMES OF INDIA Newspaper for the recruitment of TGT plus PRT job vacancies. Interested and eligible job aspirants are requested to apply with in 15th June 2018. Check out further more details below. About School: BBPS, JHARLI, a project school in collaboration with APCPL-IGSTPP, Jharli, had its humble beginning in the year 2013. Within a short period of time, the school has marked its great and remarkable presence in the remote areas of Jhajjar,Haryana and nearby cities by giving quality education to its children. The lush green surroundings and safe & secure environment make the school most conducive for an excellent teaching learning experience.